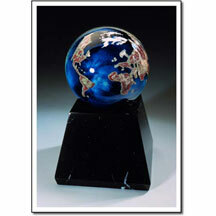 http://site.laserxpressions.com / Shop by Price / Under $500 / Blue Planet 5"
Hand-blown crystal sculpture mounted on marble base. Every piece is handmade, and therefore may differ slightly in size and shape. Imprint Area: 3.25" x 1.5"